African stars Alikiba (Tanzania) and Wizkid (Nigeria) last weekend (Saturday) had a supremacy, ego-fueled disagreement during Chris Brown's Mombasa Rocks Music Festival in Kenya. 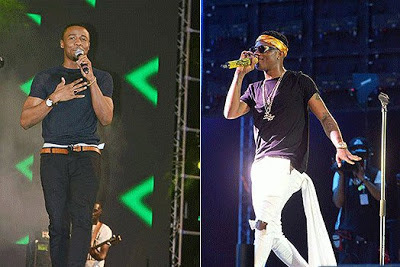 According to reports, Alikiba & Wizkid were the remaining curtain raisers at the concert but none of them was willing to perform before the other. Artistes including Alikiba had to perform before Wizkid. However, Alikiba and his team didn’t agree to this. Their reasoning was that while Wizkid was the bigger music brand across Africa, Alikiba was more popular in Kenya, particularly Mombasa thanks to his Swahili music. The organizers found a hard time negotiating with these two stars, both nominated in MTV Europe Music Awards (MTV EMA ) 2016. Before this time, a few months ago, when Diamond Platnumz came to Kenya to perform at the ODM 10-year anniversary, he was made to perform before Alikiba, his bitter rival. When he realised that he had been duped to curtain raise for his rival, he reportedly threw a tantrum and refused to exit the stage. It took the intervention of the organisers to convince him to leave the stage. Now, during the Brown's concert the weekend past, organisers who were favouring Ali Kiba made sure that he would perform after Wiz Kid. Kenyan media outfits report when Wizkid realized that he was being played to curtain raise for an artist who was beneath his level, he refused to perform. Ali Kiba on the other hand, argued that he was bigger than Wiz Kid in Kenya and was therefore, bigger and better than Wiz Kid. After all had been said and done, Wizkid performed before Ali Kiba. Unfortunately, minutes into his second song, Kiba's microphone got disconnected. Later in the night after Brown had left the stage, the organisers brought Kiba back to the stage to finish his performance.